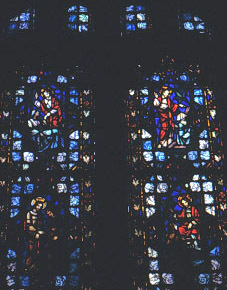 Brief Description of Subject: This window depicts Christ the Miracle Worker. On the left-upper is the Healing of the Sick and the left-lower is the Wedding at Cana. On the right-upper is the Raising of Lazarus and the right-lower is the Multiplication of the loaves and fishes. The windows background is white with vitreous and antique with an ornamental border.